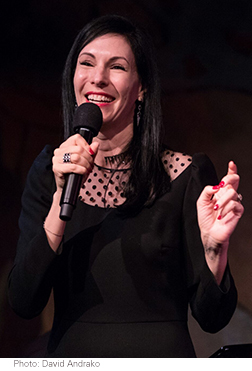 Not sure whether or not Jill Kargman would riff on the Led Zepplin classic "Stairway to Heaven," I had to admit, the comedienne, creator of Bravo's Odd Mom Out, and author of Sprinkle Glitter on my Grave brought something different to the Café Carlyle. The set list, for example, featured only eight songs. Kargman is gifted at stand up, weaving songs and stories together into a funny, entertaining evening, spoken from the perspective of an East Side mom at odds with the prevailing ethos. Tales of a Southern nanny named Sue, a Bulgarian make up artist, and a trip to Disneyworld gave new meaning to Jon Bon Jovi/ Richie Sambora's "Wanted Dead or Alive," the Alice Cooper, Desmond Child, John McCurry hit "Poison," and Nikki Sixx, Mick Mars, Tommy Lee's "Girls, Girls, Girls." Eschewing cabaret convention, Kargman did away with a ceremonial introduction to her band: musical director Marco Paguia on piano under the direction of Trip Cullman, flying by their mention. And, there was no encore. Memorable, however, were some pronouncements: her view on the French--she does good accent-- who would say after two abortions, life goes on, but flip out when given 1% milk in her cappuccino, or her take on living in suburbia: "I'd rather be in a fifth floor walkup than a Round Hill Road mansion." You do have to draw the line somewhere.